Hiking the Pipeline Canyon Trail will give you beautiful views of Lake Pleasant, a nice bit of exercise on a rolling rocky trail and, if you are lucky, a chance to commune with wild burros. From the Phoenix area, go to Lake Pleasant Road, then west on Carefree Highway to Castle Hot Springs Road. You will be turning on Cottonwood Lane to the Pay Station and then to the trailhead near the restrooms. The park offers many activities, such as camping, boating, fishing, swimming, hiking, picnicking, and wildlife viewing. At the Lake Pleasant Visitor Center, guests learn about the history of the area and desert wildlife. This is a trail without shade and is a rolling, up and down, rocky trail. It is fairly well-maintained. A floating bridge links the sections of the trail. We chose to hike the 2 mile trail out and back for a total of 4 miles. We enjoyed the huge Saguaro stands, newly budding flowers after a winter rain, ocotillo, teddy bear cholla and the views of Lake Pleasant. The views of the park from this particular trail are awesome! Some hikers talked of seeing the herds of wild burros that inhabit the area but we only heard them in the distance. The the wild burros are believed to be descendants of pack burros, which escaped or were released during the 1880s and 1890s. Burros were used to carry mining equipment. There are about 250 burros in the area today. They are fairly large, measuring up to 10 hands. You can't complain about lack of facilities along the Pipeline Trail. There are restrooms and parking at both ends of the trail and nice covered picnic tables. The park is open 24/7 every day of the year. The fee for using the park for hiking or picnicing is $5.00. 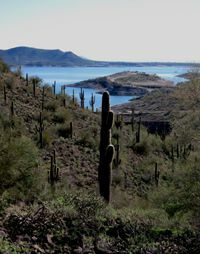 Several types of annual passes exist for Lake Pleasant Regional Park, varying from the number of days a week you can visit, to the number of watercraft included in the pass. For more information, visit Lake Pleasant Regional Park, contact the entry station at (928) 501-1710 or, the Operations Center at (602) 372-7460. Wear boots and carry a walking stick if you tend to slip or trip on rocks. It's a rocky trail in many places. There is not much shade so the trail is best hiked in the winter or in cooler times of the day.